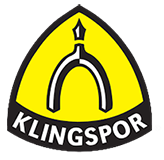 Since 1893, Klingspor has been a byword for sanding excellence, manufacturing abrasive technologies and related products that are trusted all over the world. Originally founded in Germany – where it maintains a huge commercial presence – it boasts a global reputation for high-performance in several sectors. At Engweld, we supply Klingspor slitting, cutting & grinding discs, blades, rotary burrs, flap wheels, sanding belts and more to professionals in the UK welding and metalworking industries. To address the cutting and grinding needs of our customers, we’ve selected products with the quality to match our welding equipment offering. To learn more about Klingspor Abrasives and other products, speak to a member of our technical team who will be happy to help. And much more besides – with consistency of finish and reliability of performance. When you work with abrasive products designed to operate at extremely high speeds, safety is always an important concern. To protect professionals like you where possible, Klingspor is proactive in both product development and information sharing within the sector. As a member of both the Organisation for the Safety of Abrasives (oSa) and the British Abrasives Federation, Klingspor is a leader in driving improvement. Use the filters to refine your search of Klingspor abrasives and sanding products and accessories. Or get in touch with your local sales centre to arrange a product demonstration.